Broadband connections are supposed to be always-on — unlike those days two decades back when you had to dial into a service and then hang up when you were done. The introduction of always-on broadband helped pave the way for services like Napster and Skype and is one of the defining features of many aspects of modern life in first world countries. Unfortunately, since April my broadband hasn’t been reliable, turning on and off ten to 20 times a day for periods of time that range from a minute to several hours. Last Saturday night my broadband modem turned off and didn’t turn back on until I replaced it with a spare Sunday morning. This is a frustrating experience, but my mom assures me that my Time Warner Cable connection isn’t actually unique (and TWC has actually bent over backward trying to help solve this problem). My mom who is a Comcast subscriber complains constantly of her intermittent service. She isn’t alone. Given that this intermittent broadband seems to be a common enough problem, I’d like to offer ISPs and the Federal Communication Commission a list of five things I can’t actually do with a dodgy connection. Many of them are essential to my job or make my house run more efficiently, so perhaps either providers or the agency in charge of regulating those provider can figure out how to address a connection that is mostly on, but falls short of always. Using cloud office productivity software and writing tools: This could be anything really from responding to emails to looking up a recipe to cook dinner. When your internet access is unreliable it puts a dent in your productivity. In fact, Google Docs, which Gigaom uses, doesn’t even work if there isn’t a connection, which means writing stories or editing becomes impossible. Even more frustrating is when you try to comment on a blog or save a post and your connection goes down, which can result in lost content. Managing my home: Every day at 7am my downstairs blinds open and everyday at 3 pm both my downstairs and upstairs blinds close. This keeps my house cooler and it happens even if I’m not there or am preoccupied. Except, it doesn’t happen if the broadband is off. Yes, this is a function of me using a cloud-based home automation product, but that’s the future of home automation. Without broadband my thermostat works, but there’s a lot it can’t do; same with my connected lights and other devices. Calling a friend or source: My colleagues communicate via an online collaboration service and via chat when something is urgent. My flickering online presence leads me to miss messages and can interrupt voice or video chats I have throughout the day with sources. One minute we’re talking about the FCC or connected devices and the next, we’re staring at an error message. This also interferes with my ability to record podcasts using Skype. Watching a movie: Even if I didn’t work from home, it’s frustrating to be curled up in bed watching a movie on your iPad or sitting on the couch streaming Netflix from your TV and never make it through a 45-minute TV drama without an interruption. It’s even worse when your child is watching it on Saturday morning while you try to catch a few more minutes of sleep and she can’t get service to work, so she comes up to wake you up to fix it. Playing music at a party: We stream music over our Sonos speakers using Spotify or Pandora, but the whole setup depends on a relatively consistent broadband connection. My speakers can smooth out a few quick blips, but even the best buffering falters when you get an outage of a few minutes. I spend about $30-$40 a month on internet-reliant services and have spend thousands on gadgets that function optimally when they have an always-on connection. I pay $70 a month for access to broadband, but as the quality of that service declines it makes each of these other services less valuable. It also adds costs in terms of me driving to a coffee shop so I can work or results in higher A/C bills. Both my job and quality of life depend on a reliable broadband connection, so it’s frustrating that I can’t seem to get one. Others feel the same way judging by various comments on Twitter and broadband forums. I’m glad the FCC is looking at this as part of its Measuring Broadband reports, but I don’t know what the answer is here, in terms of what Time Warner Cable can do. All I know is I used to have good, reliable broadband and since April I haven’t. I’d really like that to change. The Supreme Court says tough. You have no Constitutional rights. Your pathetic former Constitutional rights are denied to you but never to your corporate broadband supplier. They can go to court and fight with other Lords of Commerce. for the Dukes and Earls of business, life is good. But you get binding arbitration dissolving all of your Constitutional and State rights in one blow. You get a kangaroo court set up by them. They get the law when convenient, against each other and the commoners too, but you get arbitrary arbitration by their paid for servants in a mockery of justice. BTW, that other thing you care about other than buying things, namely your job, same story. Not only are you “at [their] will” serf but you have no legal rights. Yup, forced binding arbitration again. For the vast majority of Americans, there is no day possible in court, you have been stripped completely. Of course you may be dragged into the super elite’s court, but only as a victim on their terms. American, land of the complete wage slaves and home of the sheep. Nothing changes until you stop cowering and take back your legal rights. The internet is a huge and vast place with millions of miles of wire to choke down the bandwidth. 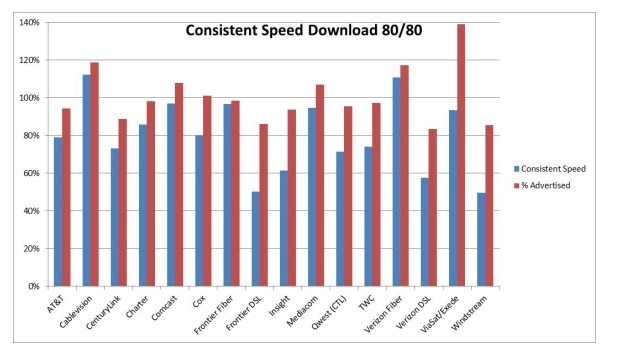 The chart shown must be averages; how about those users that pay the same for the low end of performance as those receiving the top end within promised speed/reliability. Should we be credited for every instance of poor performance in our individual user service? You provide a good case for Internet access as public service or at least as a tightly regulated utility. Only where the monopolists have agreed not to tread on each other toes. Obviously you are owned by Verizon. Other serfs are not so lucky, although the rest of Verizon is truly disgusting. Wow. You make me feel so lucky that my internet connection is reliable. That’s now something I am grateful for, although I used to take it for granted. Thank you for that new feeling. Forget cloud productivity, VoIP or Netflix…if my broadband cuts out while I’m streaming a SFGiants baseball game I’ll lose my mind. Time to move to Latvia :). I am sitting at home in the capital Riga, writing on my MacBook on a WiFi connection that is running at 145Mbps off a STANDARD 250 Mbps optical connection, for which I pay (including interactiveTV – archived or rewind to start if you miss a show by 10 minutes – with dozens of international and local channels) under EUR 30 per month. The provider is Lattelecom, owned 49% by Sweden’s TeliaSonera and 51 % by the Latvian government. The optical network and FTTH services also extend to other cities and select rural villages. Latvian Mobile Telephone (LMT) provides LTE (4G) services in much of the country, with double digit speeds. The maximum fixed network connection speed is 1Gbps, but network could handle (the CEO of Lattelecom told me this) – up to 10Gbps to the home. So, “laipni lÅ«gta ” (most welcome) – or at least send your colleague David Meyer over from Berlin. WTF? You want a hit out on you? Twenty years ago Latvia was a technical wasteland in the post-Soviet era. And now you tell lies, government actions can never be good. It is god’s truest truth. You may string along the American Pravda but you cannot tell American serfs the truth about how they get ripped off over and over. They know they have the best of everything. The robber barons keep telling the. So it must be true. Cease and desist if you know what is good for you. American Capitalism has a reach even greater than the Soviet one before it. You have been warned.